The bracelet style is called the Sailors Knot or Love Knot. This listing is for the heavier weight version, made with 12 gauge sterling silver wire for the knots and 14 gauge for the round connecting links. You may choose either a top quality swivel clasp, a fold-over clasp, or a handmade Toggle clasp which may differ slightly from the one pictured. See final photo for choices. Each knot is 13.5mm wide or a full 1/2 inch. For sizes not listed, please contact me. The first 2 photos are of the heavier weight bracelet in this listing. The last 2 are the lighter weight version (14 gauge and 16 gauge). measure the wrist at the narrowest part, snugly but not tight. Add 3/4 inch for an average fit. Wrist plus 3/4 inch is the size you should choose when ordering. For sizes above 9.5 inches please contact me for a custom listing. Average man's bracelet size is between 8 and 8.5. Average women's bracelet sze is a 7. Call it Sailors Knot or Love knot - this linked Sterling Silver bracelet is entirely handmade by me. It drapes beautifully and comfortably across your wrist. Each link including the connecting rings begins as a piece of wire which is then measured, cut and shaped by hand. There is just under 1/2 oz of solid Sterling Silver in a size 7.5 bracelet. ***Each bracelet is made when you order. I can usually get it done in 1 to 3 days unless I am out of the silver I need, which is the reason for the 1 to 2 week processing time. If you need the bracelet rushed, just let me know and I will try to accommodate you. Please read my shop policies carefully for details on shipping, payment, packaging and returns and refunds. Thanks for looking. Please leave a heart where your mouseprints have been if you like what you see. All questions happily answered. Copper V neckwire necklace. wear alone or hang a pendant "neck hugger"
Well made, sturdy and looks great on the wrist. If you're looking for a different type of bracelet design, I highly recommend it! Only problem is it was sent to me , but it was too small so I kept it and ordered another one. Sterling silver or 14k Gold filled charm bracelet Hand forged S links. 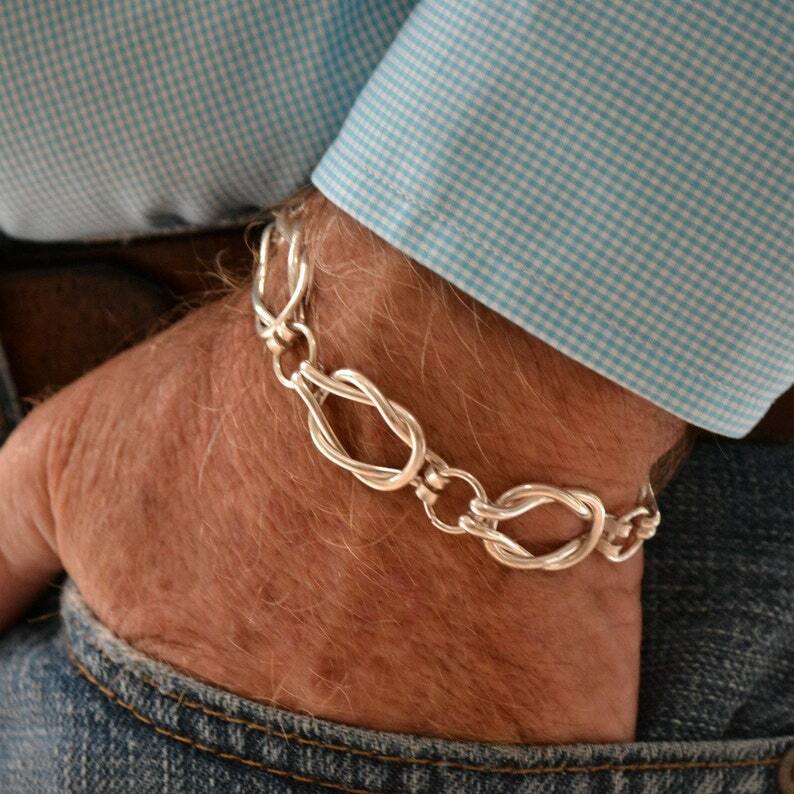 sterling silver Infinity Link bracelet. Unisex. hand forged. "Endless Love"